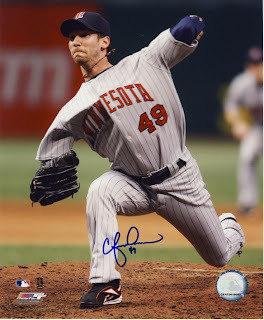 The Twin's placed Craig Breslow on waivers (whatever that means) and the Oakland A's claimed him. 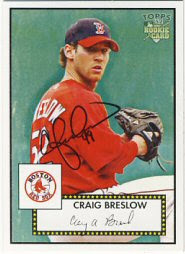 Breslow had a 6.28 ERA in 17 appearances this year. Not great. Maybe he can turn things around and have more success for the A's. 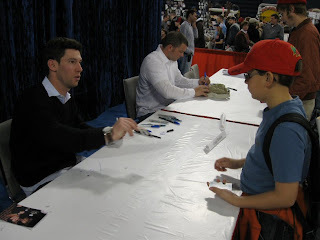 We met Breslow at TwinsFest this year and got a few items signed. The Twins called up Anthony Swarzak from Rochester, who's going to start Saturday. That should be interesting. Every night this week one of my sons has a baseball game, and with Memorial Day weekend coming up, I don't think I'll have any time to update my blog for about a week. Really not much to say, and my basement is still a mess after the plumbing work, but hopefully next week I can at least start showing some other things currently in my collection. The plumber has come and gone, leaving my basement ceiling with an eight inch gap running the length of the room where they replaced my copper pipes with plastic. Oh well. 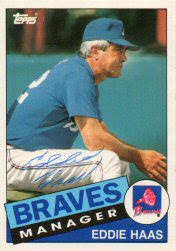 I finally got some scans of the cards I received back from Eddie Haas on Tuesday. 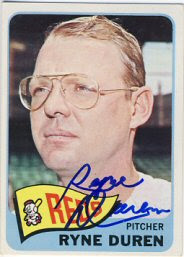 He signed his 1959 Topps "The Sporting News" Rookie Stars card, as well as his 1985 Topps Traded manager card. When we turned on the sprinklers this spring, we found yet another leak in the plumbing in the basement. The plumbers arrive tomorrow to replace all my copper lines with plastic to prevent this from happening again. My computer is still hooked up, but not the scanner, so I'm limited in what I can post. I did get a return yesterday. 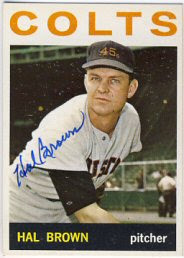 Eddie Haas signed a couple of cards. When I can, I'll get the scanner hooked up and get those cards posted. My older son received a Dave Winfield ball with Steiner holo and coa from Jim 'n Steve's Sportscards. A bargain at just $40 plus shipping. My younger son pitched three no-hit innings tonight, striking out 8 and walking 4. No runs scored. His team ended up winning by the 10-run rule in the 5th inning. Meanwhile, the Twins bullpen is beyond frustrating. They simply can't hold a lead. A surprising return yesterday since I don't have many outstanding requests. 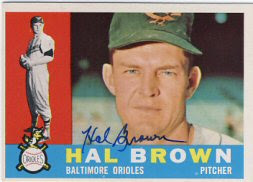 Hal Brown signed three cards for me: a 1955, 1960 and 1964 Topps. I have a bunch of signed magazines, mostly "Sport" or "Sports Illustrated", because they have great color photos of players on the cover. 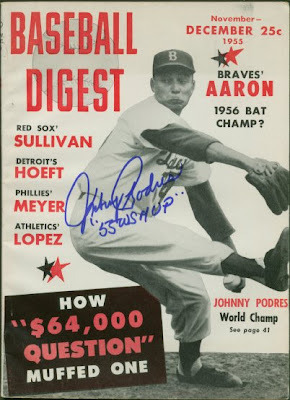 I also have a couple of "Baseball Digest" magazines signed. These magazines are much smaller, about the size of a Reader's Digest or T.V. Guide. The photos on the cover are black and white as well. Still, I like the looks of them and the black and white photo makes a blue ink autograph show up pretty well. I haven't actually read the contents of the magazine, but the layout is quite boring. Just text on cheap paper that yellows quite easily. There are no photos in the articles either. The two I have signed include Don Larsen, who signed this for me back in 2003, and Johnny Podres, who signed his back in 2004. Mr. Podres passed away in January of 2008. These magazines are great for getting signed, but I would rate them pretty low as just an old magazine to read. I prefer the Sport and Sports Illustrated magazines, and much prefer the Famous Sluggers Yearbooks. Today I got a couple of cards that I sent of to gatexautographs to get signed. 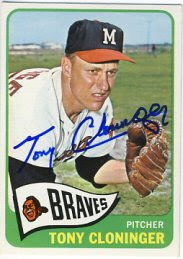 Tony Cloninger signed his 1965 Topps. 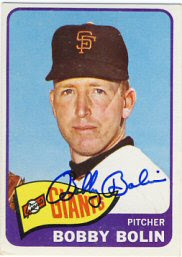 And Bobby Bolin also signed his. Both these guys are pretty tough signers ttm so I'm happy to get them. The charges were reasonable, $15 for Cloninger and $10 for Bolin, and an extra $1 each for return shipping. The low shipping is great because most places want $8-$10 just to ship something back. A while ago I bought an old ticket stub on eBay. I'm not sure what attracted me to it, other than it seemed to be a physical connection to history. This particular ticket was for a game on June 20th, 1942. My Mom had just turned eight, the Battle of Midway took place 16 days earlier, and 7,254 people showed up at Cleveland Stadium for a game between the Indians and the Yankees. 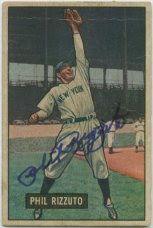 Al Smith of the Indians threw a 1-hitter, with Joe Dimaggio getting the only hit. Cleveland won by a score of 1-0. I'm not sure where section 29 was in Cleveland Stadium, but row 6, seat 2 sounds like a good spot to watch Joe Dimaggio and Phil Rizzuto take on Lou Boudreau and Bob Lemon. 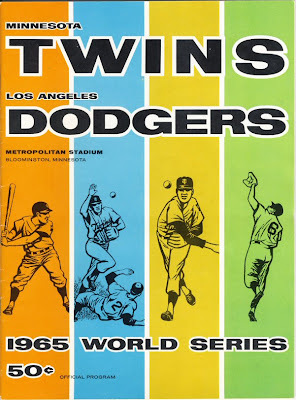 A few days ago I showed off my 1965 World Series program that was sold at the Dodger home games. 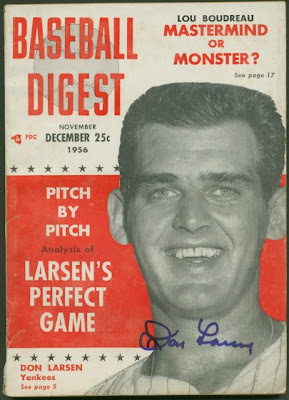 I also have the program that was sold at Metropolitan Stadium. The cover isn't nearly as interesting as the one sold in L.A.. The inside is pretty much the same with pictures and short bios on each of the players and coaches. The ads are similar, except they're for Minnesota companies. Based on the partial scoring that was done on the score card on the inside, this one was purchased either at Game 2 on October 7, 1965, or Game 7 on October 14, 1965, because both Koufax and Kaat pitched in those games. The Dodgers won each of those. I got a surprise when I received this one after having won it in an eBay auction. There are two ticket stubs taped inside. When I first saw them, I was really excited because I assumed they would be for the World Series game, but they aren't. They're from the game on August 24th, 1965, when the Twins lost to the Yankees 1-2. Mel Stottlemyer was the winning pitcher for the Yankees, with Jim Perry earning the loss for the Twins. Killebrew didn't play. Tom Tresh hit a homer for the Yankees. Sandy Valdespino hit a triple for the Twins and Tony Oliva stole his 14th base of the season. Attendence was 33,772. 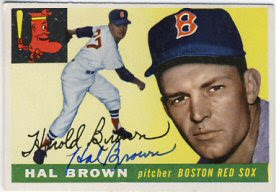 I found this information on a great site that has old box scores: www.retrosheet.org. I was excited to receive my package from the MLBPAA signing today, until I opened it. My Jim Kaat bobblehead was unsigned. 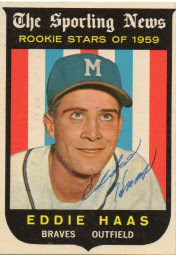 My Ryne Duren 1965 Topps was signed, but I also received another signed Ryne Duren card that I didn't send, and I didn't get back my Tommy John 1965 Topps. What a mess. Hopefully I can get it straightened out.